For those without comedic tastes, the self-proclaimed experts at Wikipedia think they have an article about iPod Lo-Fi. The iPod Lo-Fi is the ultimate companion for the iPod mono media player, and is an boombox like device designed by Apple. It is specially made for the iPod mono mp3 player. This boombox is mono, like the iPod mono. 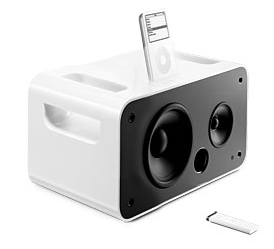 If you would to connect a regular stereo iPod to this boombox (without an adapter), it would make the speaker element implode. But it can be made to fit every iPod from iPod yotta all the way down to iPod yocto, with the usage of a special stereo-mono adapter. 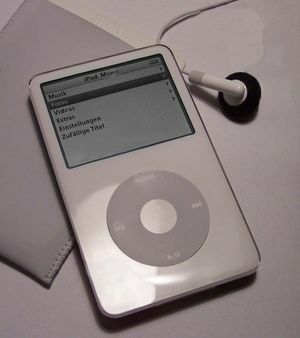 You could also send in your regular iPod to Apple to have it converted to a iPod mono, thus you could use this device with the player without the need of an adapter. It only costs 1024 Pieces of Eight (about $128), and is not as expensive as regular speakers, but more expensive than a piece of paper. iPod mono - The iPod mono is the latest product in the iPod family, created by Apple. It was a cost-cutting measure designed to increase Apple's already enormous product margins. It only has mono sound and a black-and-white screen. As well, it does not supoprt AAC and only has 640k of memory. ↑ This is not to be confused with the iVirus mono which is not an mp3 player but a special virus genetically engineered by the illuminati to cause high school students in america to miss weeks of school at a time. This iPod-related article is a pile of crap. The stubmitter may also have crabs. Click here to help cure crabs. This page was last edited on 22 December 2015, at 01:27.